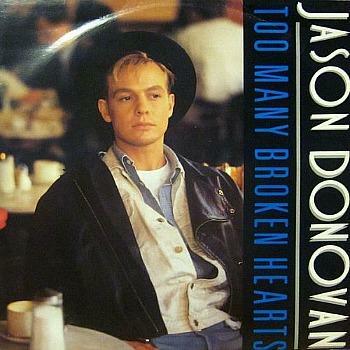 This upbeat and very infectious pop track was Jason Donovan's third single release and first solo No.1 single in the UK - his previous single "Especially For You" reached No.1 but was a duet with Kylie Minogue. In Australia the song peaked at #7. You may have guessed that the song was produced by Stock, Aitken & Waterman, who also produced Kylie's earlier work. The track featured on the album Ten Good Reasons which became the biggest-selling album of 1989, shifting 1.5 million copies. The single itself sold around 400,000 units in the UK alone. The song entered the UK singles chart at #9 on 26th Feb 1989, climbing to No.1 the following week (5th March) where it remained for two weeks. However, the single remained at No.2 for another three weeks while Madonna was at No.1 with "Like A Prayer". I must mention a comment I spotted on Youtube from someone who, when they were younger, thought that Jason was singing "Too many broken huts in the World". So funny, I can't stop laughing! The B-side on all versions of the single featured the track "Wrap My Arms Around You" (3:40). An extended and instrumental version of the A-side were included on the 12 inch vinyl. In the video, we see Jason residing in a log cabin situated in the mountains. For a good part of the video, Jason is pretending to strum his guitar while stood amongst the mountain scenery and also while sat in the porch of his cabin. We also see him chop a log with an axe and drive a pick-up. It's not the most exciting video to watch, but the scenery is pretty idyllic, at least. During the 80's the Australian singer and actor had six top 5 singles in the UK. The ex-Neighbours actor has achieved four #1 singles overall, with the other two being "Sealed With a Kiss" (1989) and "Any Dream Will Do" (1991) from Joseph and the Amazing Technicolour Dreamcoat.